1. In large saucepot, heat oil over medium-high heat. Add carrots, celery and onion, and cook 5 to 7 minutes or until vegetables are almost tender, stirring occasionally. Add sausage and mushrooms, and cook 5 to 7 minutes longer or until vegetables are just tender, stirring occasionally. Stir in tomatoes, lentils, broth and seasonings and heat to simmering. 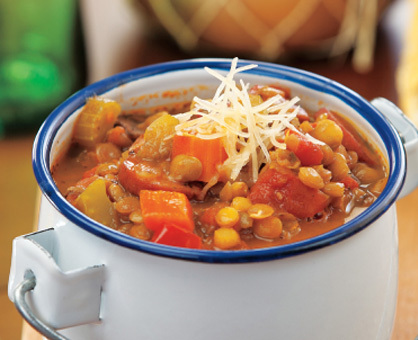 Reduce heat to medium and simmer 45 to 55 minutes or until lentils are tender. Serve soup sprinkled with cheese.